Mattermark started with an audacious goal: answer the world’s business questions. We directed all of our initial energy at companies, and now you can answer many of the questions you have about high-growth companies (and even predict which startups are ready to raise money). Fast-forward 2 years after our founding, and the world of investing is more global and distributed. Finding answers about the funding ecosystem is now as difficult as researching high-growth companies once was. 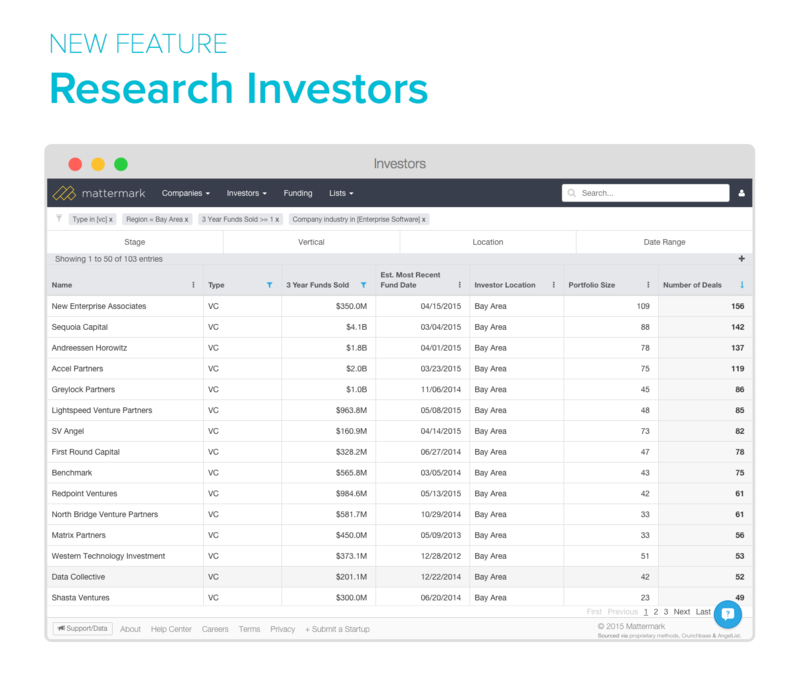 That changes today with the ability to research investors. We’ve doubled the questions you can answer with Mattermark. Now, Mattermark includes data on the entire investor ecosystem, so you can quantify and structure investor data as you need. Investors can now use Mattermark to find later stage investors to do follow-on investments. They can answer questions like, “What Bay Area investors have done Series B Internet of Things deals in 2015?” They’ll even use Mattermark to benchmark themselves against competition in their industries of expertise. Startup accelerators can find all the investors who do Series A deals in the industries their portfolio companies operate in, and better position them to succeed. Founders can quickly find active investors who invest in companies in their space, and at their stage, so they can get back to building their company. Salespeople can identify the most active investors they need to be networking with, and open more deal opportunities. To see the 25 investors who’ve done the most Series A deals this year, or answer YOUR investor questions, sign up for a free trial of Mattermark.